Best Manual Wheelchairs  - All You Need To Know! Best Manual Wheelchairs  – All You Need To Know! Best Manual Wheelchairs : All You Need To Know! One of the important medical equipment that offers utility and independence to people with impaired mobility is a wheelchair. The disability to move can result from an illness or an unfortunate accident. With a wheelchair, such individuals are able to restore their ability to move with freedom without the needs for support and assistance from other people. While there are varieties of wheelchairs available, such as electric, manual, and both, purchasing the best wheelchair is a complicated procedure. But, electric wheelchairs are quite expensive and not friendly to everyone’s pocket. Hence, the best budget choice is to purchase a good manual wheelchair. Why Buy a Manual Wheelchair? A manual wheelchair is ideal for people whose physical condition will allow them to propel it, or who have support of another individual to push them. Such wheelchairs are available since long and have been serving people with various disabilities. The best thing about manual wheelchairs is that they offer controlled mobility and speed to the user. They are available in various sizes and can even be folded for easy transport. Most importantly, manual wheelchairs are pocket-friendly and hence perfect for those with temporary illness or immobility. If you are unaware which manual wheelchair would be perfect for you then here check our list of 10 best manual wheelchairs that promise to offer you high safety, great comfort, controlled movement, and excellent maneuverability. 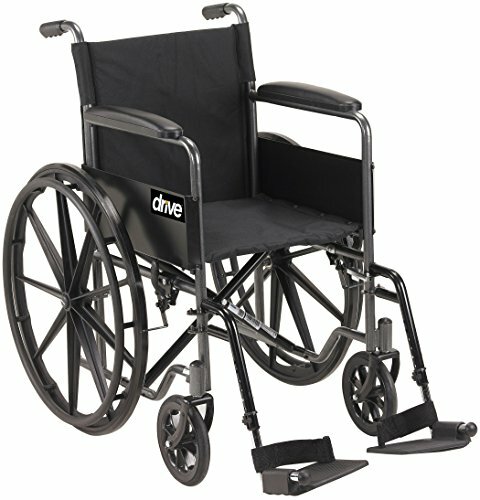 The Drive Medical Blue Streak wheelchair is a sturdy and versatile unit perfect for moderate use. It comes with basic yet functional features, which makes it an ideal choice for those who need a wheelchair on an occasional basis, like shopping, traveling, and more. The car can be used on exterior smooth surfaces but is most suitable for indoor use. Now, the compact size and lightweight makes this wheelchair transport friendly. If budget is a major concern for you, then this will serve as an economical solution. Moreover, the seating is made with vinyl and metal frame, which makes it easy-to-clean and even imparts excellent resistance from cracks and chips. 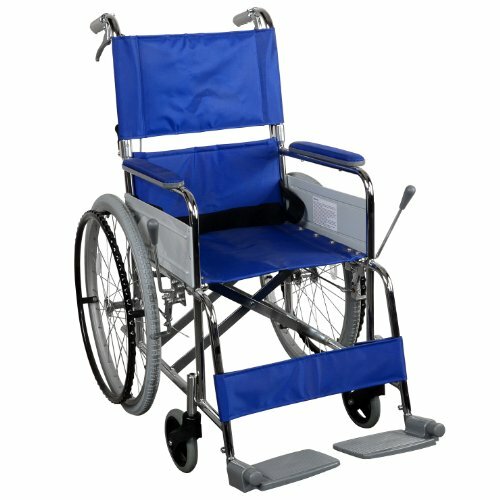 Besides being a low-maintenance wheelchair, Drive Medical Blue Streak delivers great comfort and utility to the user. The adjustable armrests make it easy to transfer out and in of the chair. What you may not like are comparatively short footrests that may not be comfortable for taller individuals and minimal seat padding, which demand an extra cushion for added comfort. 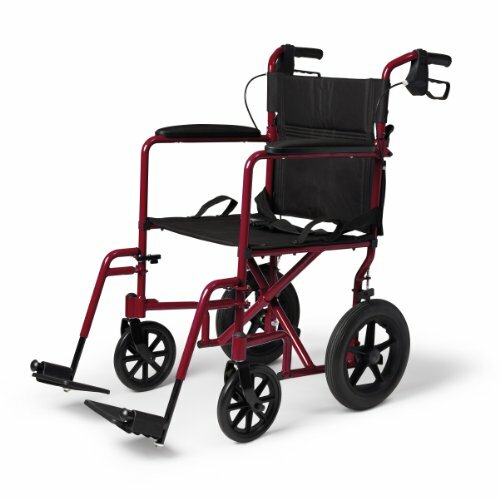 With big size 12 inch rear wheels, Medline transport wheelchair delivers excellent performance even on uneven, rough surfaces. This is an excellent transport wheelchair, which means it comes in compact and foldable design. The loop-style manual handbrake is another great feature that enhances the safety of the user. The wheelchair has been designed with powder coated aluminum ultra-light frame, which can withstand a weight capacity of 300lbs and is extremely durable. The care of the user is further enhanced by incorporating a seat belt for the users. While the footrests are detachable, the armrests are permanent and fixed to one position. Now, if we talk about the back, then it can be folded down for convenient transport and storage. Hence, if the user is moving outdoors and needs some important stuff to carry along, then this is an excellent adjustment that can be made with ease. The comfortable nylon upholstery is an added advantage that ensures to offer maximum comfort to the user. Seat Width 16" x 17"
If cost is not a constraint, then the Karman Healthcare S-105 ultra-lightweight wheelchair is a premium product available with manual maneuverability. In addition to ultra-lightweight, which makes it very much easy to use; this wheelchair is packed with numerous rich features that are worth its price. It comes with swing away footrests that offer great comfort and mobility to the users and can be used as per your requirement. The backrest is another great feature that can be folded and adjusted for a healthy back. The seat is upholstered with high-quality fabric that holds absolute resistance to bacteria. Hence, you will always stay healthy. The wheelchair comes with S-shaped ergonomic design engineered with steel imparting more durability and longevity to the product. The leg rests come with a tube-in center that assures better side leg support to the users. With a weight of only 27lbs, this wheelchair supports weight holding capacity of up to 250 pounds. It is a lightweight, transport-friendly, and comforting wheelchair available at a slightly high price. The Invacare lightweight tracer EX2 wheelchair sets new standards to the manual wheelchair mechanism. The tracer EX2 comes with unmatched design and advanced technology of the Invacare 9000 series. It hosts a dual axle position that enables to reuse the 24inch rear wheels and 8inch wheels for adults. The hemi separation footrest is its unique feature. Additionally, it comes with a range of accessories as well as a lifetime warranty that makes it an excellent choice for the users. The chair meets recent standards for best manual wheelchairs in product performance. It is a comfy and lightweight product that tends to move smoothly when pushed without needing any additional efforts. You can get an extra pair of brakes and seat. Isn’t this exciting? Moreover, the chair can support a maximum weight of 250 pounds. It is undoubtedly one of the best wheelchairs ideals for individuals with a temporary disability. It is because it is not engineered with high-quality materials, and hence, may not be able to serve long years. 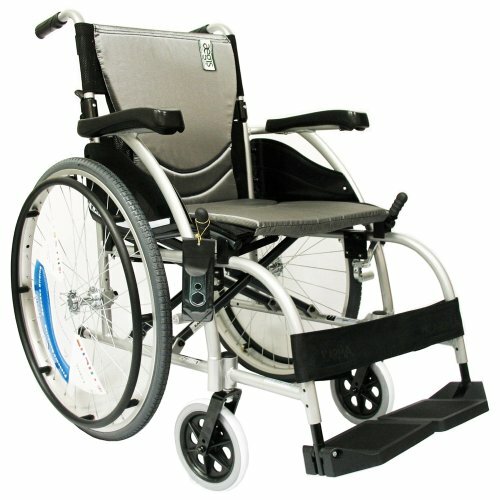 Drive Viper Deluxe High Strength, Lightweight, Dual Axle 18 " Wheelchair with Flip Back Desk Arms *Free Home Delivery! VIPER weighs 32 lbs. (Excluding front rigging). Easier to propel and transport. New frame style eliminates seat guides and allows for custom backs and accessories. Durable, heavy gauge flame retardant nylon upholstery resists mildew and bacteria. Composite Mag-style wheels with aluminum hand rims are lightweight and maintenance free. The Viper deluxe lightweight wheelchair from Drive Medical manages to offer users more in terms of quality and customization. In brief, the wheelchair offers numerous rich features to patients with higher mobility, enabling them to get on or off the wheelchair with absolute ease. The best thing about this wheelchair is that it is available in a range of sizing options from 12 inches to 20-inch seat width. Moreover, it offers patients with two lengths of armrests – desk length and standard length, which is a rarely available feature. The armrest is also detachable and can be adjusted to meet the comfort level of patients. The swing-away footrest is well-combined with adjustable backrest offering great comfort to the user. You can even regulate the height of the back and provide users the ability to align on top of the backrest to a specific position, which is supportive and comfortable. With the unique feature of hand brakes for the supporting companion, the Cycle Force Manual wheelchair is the next in our list. This wheelchair has been designed especially for companion propelling and hence is one of the best solutions for those who need support for mobility. It is because it has handbrakes at the upper handlebars. The cutting-edge design is engineered with a chrome plated steel frame with steel and alloy wheels. Furthermore, the 100% nylon seat makes it an excellent choice and offer great comfort to the users. One thing that users will love is its large back pocket that secured loops and hooks fasteners for easy and quick access to storage. It comes with seat straps to offer safety to the user. Additionally, it has an excellent weight holding capacity of up to 280 pounds. The elegant yet comfortable design of this wheelchair makes it a perfect fit for the budget of all those who want a decent looking wheelchair offering various functionalities, complete safety, and still low pricing. 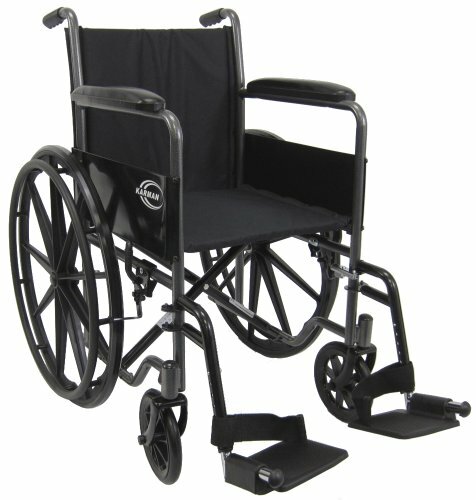 This is one of the most economical wheelchairs available in the market. Despite offering numerous rich features, this wheelchair comes at a great price, and this is what that makes it a preferred among the users. The wheelchair is designed with a steel frame further coated with silver powder for high strength and durability. 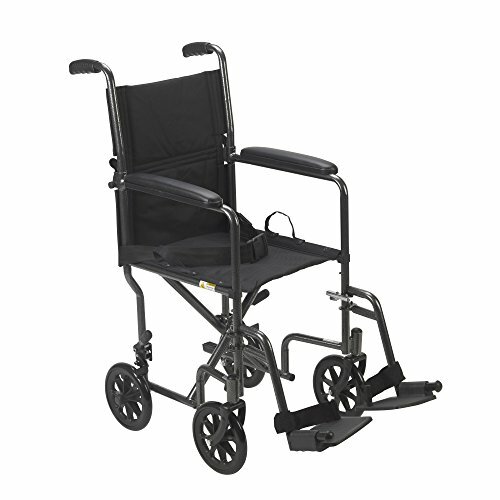 The bigger rear wheels make it easier and convenient to move the chair on uneven and rough surfaces. Now, if you want to avail convenient transport or storage, then the wheelchair can be quickly folded into a compact size. In addition to this, it has a much wider seat as compared to other regular wheelchairs available. Hence, the user will get great comfort and an excellent fit while using this wheelchair. The padded armrests and comfortable back ensure that users always feel at ease. 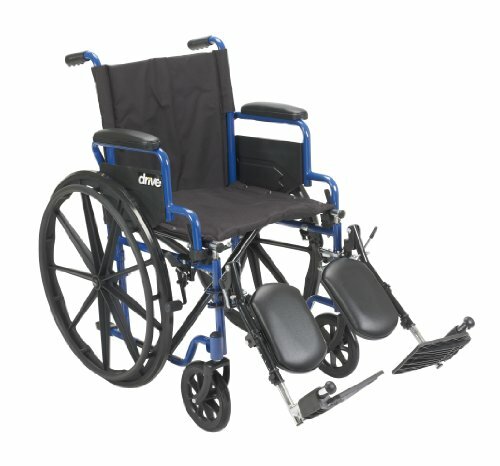 Height adjustable back; Patented adjustable depth seat from 16"-18"
Another premium product in our list of best manual wheelchairs is the lightweight dual axle wheelchair from Drive Medical. With the perfect height, comfortable seating, and excellent features, it is one of the best wheelchairs to purchase. The finest aspect of this wheelchair is that its height, as well as the width of the seat, can be adjusted as per utility. Hence, no matter what is the size and height of the user, he will get maximum comfort within this chair. The next thing is its padded armrests that again have been designed keeping in check the comfort of the user. The wheelchair comes with upholstery made of nylon that is flame-resistant and extremely easy to clean. The lightweight is an added bonus, which makes it a transport-friendly product. Most importantly, it has 8inch front casters that are angle adjustable and have 3 height adjustments. The 3 position quick-release back axles allow for seat dump and are maintenance free. 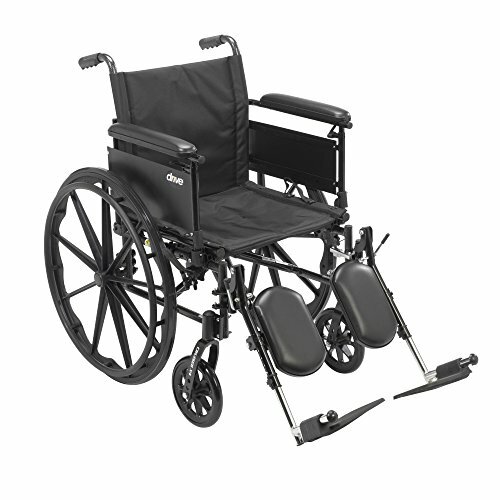 With excellent reliability and durable steel frame, the Drive Medical lightweight steel transport wheelchair with fixed armrests is the next amazing product on our list. This wheelchair comes with excellent stability that makes it ideal for users looking for a permanent solution to their immobility. It is not too wide, and this makes it easier to propel it in wider as well as narrow spaces with ease. While the swing away footrests offer great comfort, the nylon upholstery is perfect to sit for long hours as well as to clean. Next is the backrest of this chair is comforting to the user. As its name suggests, it is transported friendly and hence can be folded flat easily for convenient transportation. In addition to superior maneuverability, the chair comes with cushioned armrests. It is an economical product with lightweight and maintenance-free operations. The Karman lightweight wheelchair comes with removable footrest and adjustable seat height, thereby standing as one of the best manual wheelchairs for the user. The wheelchair supports weight holding capacity of up to 250 pounds and still is one of the lightest wheelchairs available. The upholstery is done with high-quality material and is easy to clean. Besides removable footrest, it is possible to adjust the footplate as well as help loop to offer maximum comfort to the user. The push to lock manual brakes imparts maximum safety to the users. It comes with 24 x 1 rear wheels and 8 x 1 flat free casters. 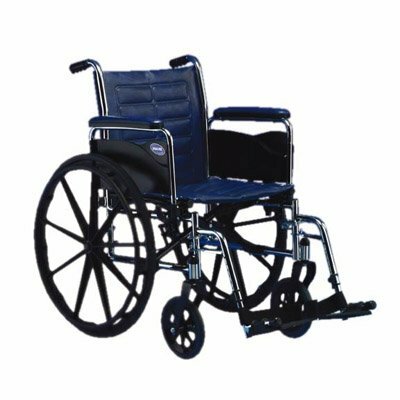 With a silver vein color frame, this is a highly durable wheelchair that is ideal for individuals with temporary or permanent mobility issues. A manual wheelchair is propelled by the user and therefore need upper body strength. There are different types of manual wheelchairs available such as ultra-lightweight, standing wheelchairs, tilting wheelchairs, pediatric wheelchair, specialty wheelchairs, and heavy-duty wheelchairs. Such wheelchairs are quite convenient to push, have unlimited range, and comes with a simple maneuver. As compared to powered or electric wheelchairs, manual wheelchairs are quite cost-efficient. One must buy a manual wheelchair depending on physical ability, personal preferences, and lifestyle. Other than this, you must also consider other factors like type of terrain and the amount of a wheelchair. Before you select the best manual wheelchair for your requirements, you must consider some important factors. This will help you buy an appropriate and the best wheelchair for yourself. Based on the sort of control you want, a wheelchair can be transported or propelled. Transport wheelchairs come with handlebars on the back so that any companion can assist in pushing the chair forward. Self-propelled wheelchairs are those that the users move on their own with control of upper limbs. A heavy-duty wheelchair is designed for users that have a weight larger than average. Such wheelchairs are designed for bariatric patients to support hefty individuals. It comes with reclining features to help comfort and mobility. Other than this are ultra-lightweight wheelchairs that range between 25-40 pounds and are ideal for travel and portability. Such wheelchairs offer users the advantage of cushioned seats, back handles, and bigger rear wheels for self-propulsion. Read more about best lightweight wheelchairs. Some wheelchairs are designed for particular use. Pediatric wheelchairs are designed specifically for children, while sports wheelchairs offer customized maneuverability for distinct activities, such as soccer, basketball, and more. Recliner wheelchairs offer the ease to adjust back of the chair for maximum comfort in case you have a tall height that requires longer backrests and bigger leg space. But if you want greater control over the wheelchair, then hemi height wheelchairs are available with adjusted to lower seat heights and offer double options where it is possible for users to adjust the seat of the height. Wheelchairs are available in different seat sizes. You can select the seat size as per your convenience and one that can accommodate your weight. The lighter manual wheelchair is, the easier it would be to propel it, lift it, and carrying it. Hence, make sure you select a wheelchair that can be propelled with ease and can be transported conveniently to any place. You must select a wheelchair with a seat height that can be adjusted with ease so that feet of a person is 5 cm above the floor while sitting. Since you would be self-propelling the wheelchair, so such a height is needed to make sure that you don’t experience any problem in your knees. This height must be up to the height of the average bystander’s waistline. This will allow other people or your companion to move the wheelchair with ease. Based on the thickness of the cushion, the height of your armrest must be 2-3 cms. above the height of your elbow for maximum comfort. For users who would be self-propelling the wheelchair, it is essential to avail an optimum backrest height, which must be 10cm below the armpit level. So, pick the best manual wheelchair! Pick any one of these wonderful manual wheelchairs to meet your mobility needs and you will be able to gain comfort for rest of your life. No more discomfort or struggling with maneuverability! With the right manual wheelchair you will be able to serve your life and eliminate all sorts of problems. Hence, get an appropriate manual wheelchair and avail absolute independence while moving around. Dr. David Taylor is a medical professional and an avid blogger. He holds an M.D. from Drexel University & a Ph.D. from Indiana University School of Medicine. Dr. David loves to utilize technology to improve healthcare and he does it daily through BestRatedDocs.com. He founded the company in 2016 with the vision to make the discoverability of the best healthcare facilities & best products simple and easy. His passion for informatics and using technology to empower healthcare professionals and the patients they serve is unmatched. He regularly blogs about technology, health IT, medical products and other healthcare topics at bestrateddocs.com.